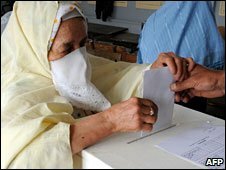 Some 74% of voters took part in Algeria's elections despite a boycott by some opposition parties, the interior minister says. Correspondents say there was little popular enthusiasm for the poll, which many saw as a foregone conclusion - a win for President Abdelaziz Bouteflika. The vote was relatively peaceful although two soldiers were wounded when a polling station was bombed. The attack happened in the mountainous Kabylie region in eastern Algeria. There were also three attempted attacks, officials say. Interior Minister Yazid Zerhouni announced the turnout figures, which included a rate of 65% in the capital, Algiers. The AP news agency reports that a random sample of 17 polling stations in the city reported figures far lower. The former head of Algeria's human rights league, Ali Yehya Abdel-Nour told the BBC that official turnout figures had been exaggerated. He also said the outcome of the lection had been decided on 12 November last year, when the government chose to amend the constitution to allow Mr Bouteflika to run for a third term in office. Some opposition groups have described the election as a charade. The little-known opposition candidates include two nationalists, two moderate Islamists and a woman left-winger. Was known at the UN as the "dandy diplomat"
Mr Bouteflika, 72, has promised to spend $150bn (£102bn) on development projects and create three million jobs, and stresses the fact that he has restored stability in Algeria. His critics say he is using the threat of renewed violence from Islamic militants to mask the country's deeper problems of poverty, high unemployment and corruption. Many people told the BBC they planned to sit out the vote in the overwhelming conviction that Mr Bouteflika would win regardless of their ballot. Some said they would cast blank ballots in protest. One voter, 26-year-old sport teacher Abdeljaleel Saad, told the BBC: "I will not vote. We already know the result, so what is the point?" Algeria is slowly recovering from the 1990s civil war which left up to 150,000 people dead. The conflict was triggered when the military intervened in a parliamentary poll in 1991 to stop an Islamist victory.